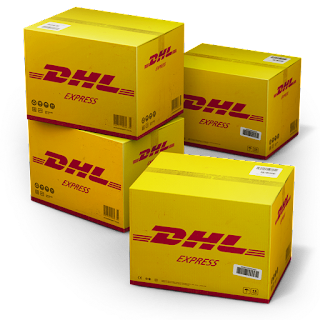 DHL Express Package Delivery Invoice,PI, Bill of landing. Your parcel has arrived at the post office on 6/1 JANUARY, 2019. To receive your parcel, Please see and check attached shipping documents. CONFIDENTIALITY CAUTION: This message is intended only for the use of the individual or entity to whom it is addressed and may be confidential in nature. If you are not the intended recipient, please notify us immediately by return e-mail and please do delete this message. You should not disseminate, distribute, copy or disclose any information contained herein to any third party. Prior to leaving for this visit to India, several people have asked me about how they could help out and since I have been back in India the past month others have emailed me and expressed an interest in supporting the school I used to work with and still support through fund raising, technical assistance and lots of prayers and hugs! Thank you to everyone that wants to help out. On my visit out to the boarding school (about 3 hours by car or 4 hours by train/auto rickshaw north of Mumbai), it was so rewarding to see the growth of the school and the students. 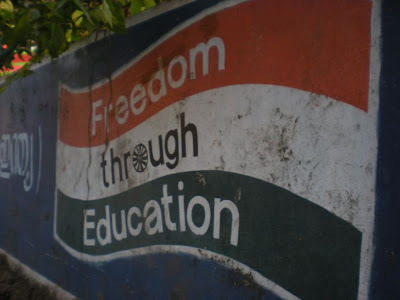 Of course there are still areas that need improvement, but great work is being done for example, to address the shortage of gas canisters for cooking, a constant struggle, the school now has a solar cooker. 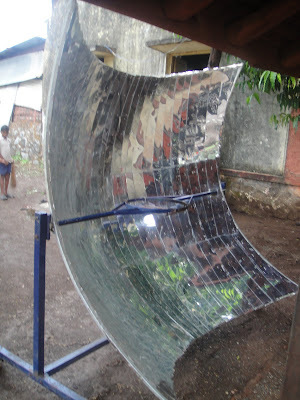 It can cook 12 kg of dal in about 40 mins if there is good sunlight. There are plans to start a school specific dairy with 6 cows. The cow shed will be built near the kitchen. The milk will be converted to ghee (clarified butter) and sold, so it will be a self sustaining project, and the buttermilk (chaas, not the same kind of buttermilk we have in the US) given to the children everyday to increase their protein and calcium intake (this is an all veg school! no egg either). The dung and the waste from the hostel toilets will be used in the biogas plant proposed to be put up. I met several new staff members, young, seemed very caring and they were from the local town so a positive that the school can employ and support the local economy. 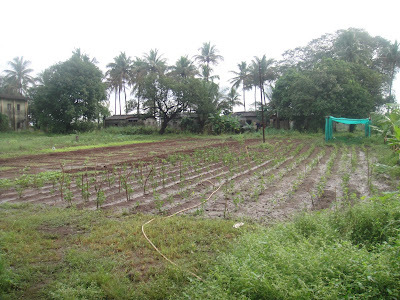 The student gardens looked great and are able to provide the school with needed vegetables. 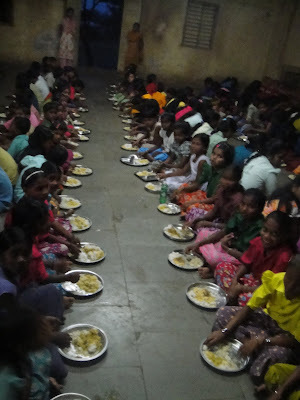 Still is not able to provide enough, we would like to be able to serve veggies at two meals versus only one, that is one of the needs we are requesting as donations. Sister Sunila had the School Based Health Centre looking great, with the two nurses employed they are able to provide around the clock health care to the students. Sister Sunila and Sister Savita the Junior Nurse work together, making rounds at the hostels, attending to students that visit the health centre, taking students with special medical needs to Mumbai for their doctor visits, organizing and managing health camps with doctors and interns who visit from the Somaiya Medical College and the plan is to start a training centre at the school for this model to be replicated elsewhere. There were many other improvements I noticed on my visit and in the past year the school has made huge strides and are becoming a model centre for the area. 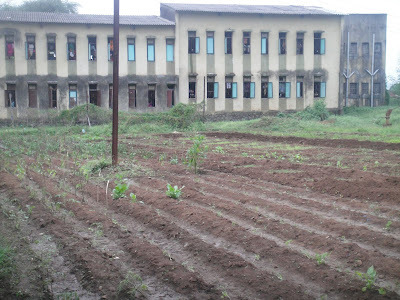 The school has around 500 hundred students from the 1st to 10th standard. The exam at the end of 10th standard is a determinant for students advancing their studies. For the 2009 - 2010 school year 100% of the students passed their exam and several passed with honors! This is an improvement from an 11% passing mark just five years ago. There are several students competing and winning in athletic events in the past couple of school years, a coach was hired to focus on developing students for running, kabadi and volleyball competitions. 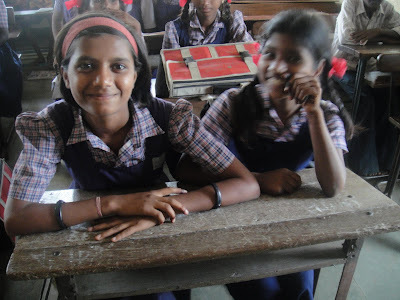 This school year's 10th standard class has nine female students (about 30% of class), 9th standard has twelve female students closer to the 50% mark we are aiming. For recent batches of students there has been a goal in enrolling male and female 50/50 and then a focus on retaining students. A new project is taking off in a village area that a large number of Nareshwadi students are from, it is a micro enterprise project to provide women in the community training in various trades to earn a living. 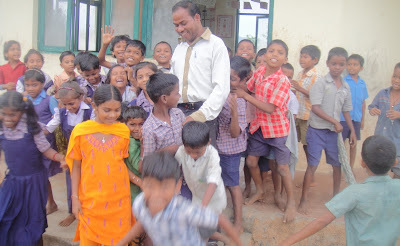 Many of Nareshwadi student's parents are from local tribal communities and migrate for work. 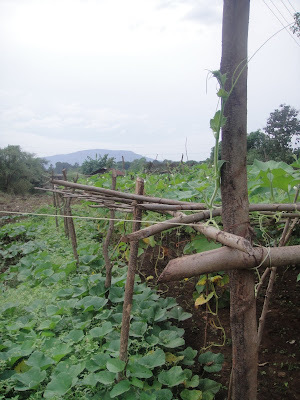 One goal of this village adoption project is to allow for the mothers to have an option to stay at home and work. 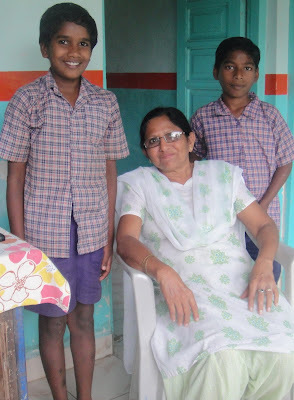 So for those of you interested in supporting the school you can access the Nareshwadi site directly at www.nareshwadi.org. 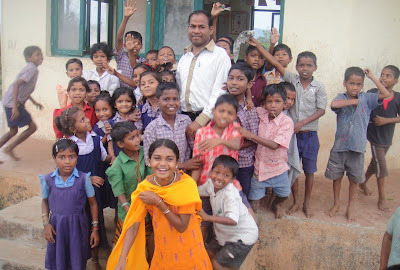 At the moment donations and grants have been made through direct transfers from bank accounts overseas to the Trust who owns and manages NLC, Girivinasi Educational Trust which was established by The Somaiya Group. I left Mumbai April 3rd. Me, ruby & zara boarded delta flight 185 - 17 hours to atlanta. woo hoo! After having to take each cat out of their cage, walk them thru the metal detector, send each cage individually thru the bag screener. Again, go thru delta's extra assuring security - each cat out of their cage and the guard searching the cage, I made it on. A friend helped me out and the delta agent assigning seats gave me a seat with an empty beside....so I could place both cats in the seats underneath. After, zara nearly ripping thru the cage on the way to the airport, me in tears because (maybe leaving india was part of it) but I had forgotten the upc code stickers for the cats microchip implants, karilyn, paul and mukesh comforting me, mukesh sitting with me for 3 hours waiting for the flight we finally took off! USA. I think it had been 8 or 9 months and I was not really ready. I had extended my stay in Mumbai, had some fun coaching a middle school girl's basketball team : ) I like that age group and reminded me of the fun times I had coaching my sophomore and high school girls in Norman. 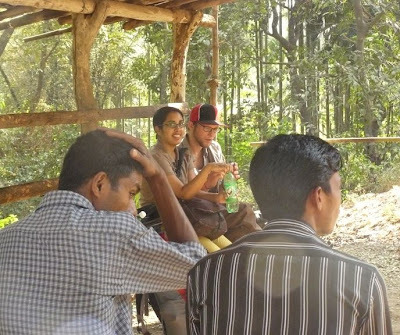 I had some great times with friends before leaving, trips to goa! scooters, fresh raviolis, boat rides, train rides, pool parties, retro music, brunches, bollywood dance classes, my kiddos and colleagues at nareshwadi and atma and amazing, fabulous, crazy lovely people I will not forget (sniff, sniff). 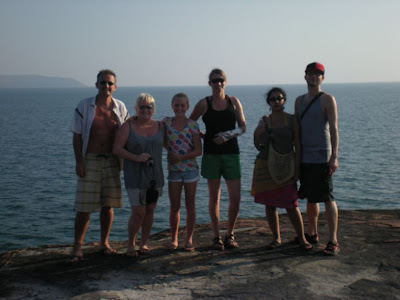 I stayed with paul and karilyn for about 6 hospitable months (moved with them!) and then because I decided to extend my stay I sub let a place for a few months and again synchroniscally met up with a couple of friends who I let stay as a favor and then we ended up decided to all be roomies. Why not stuff 3 people in a one bedroom?! It is only 2 months. It surpisingly worked out well. I think we stuffed 6 people in at one time, with visitors and sleepovers. Again, the people I have met in my 4 1/2 years and the experiences have shaped my life. Lifelong friends. So now on with life. I was not as ambitious in securing a job prior to departing india, it was my plan but did not pan out. I am in Tulsa now, on top of the international job search. and finally updating my blog. I was reunited with my blog title inspiration, the bleu velo and have been enjoying some rides around the arkansas river. I spent time in Alabama with my college friend Ali, in California with my grandparents and my friend from jr high, for the past 23 years, in Colorado and her new baby braxton (www.worldofbrax.blogspot.com). Now back in Tulsa with family, I saw my brother and sister graduate (2 grueling ceremonies, why do theyhave to be sooo long?!) from college - yay!!! Celebrated mother's day with all my siblings, first time we have all been together in a few years in tulsa. So now hard on the job search, looking for international health and development positions. I would love another international posting, India or elsewhere. Most of the US based positions I am interested in are in DC, NY or SF....all places I would love to try out living. for a few years! 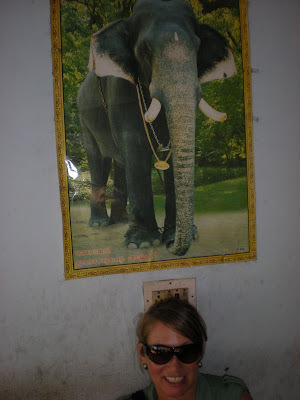 I miss the daily excitement of India. 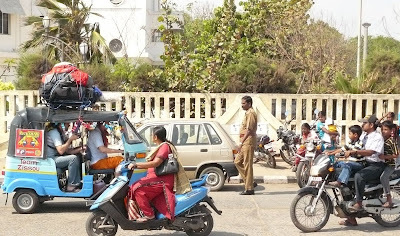 Loud, stimulating rickshaw rides. Fruit and veggie wallas. 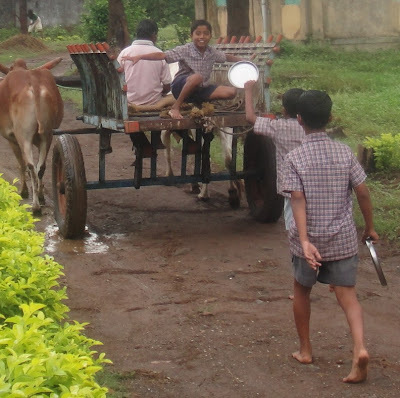 Kids in the village. My friends. The food. But i am happy to have my family here in tulsa. 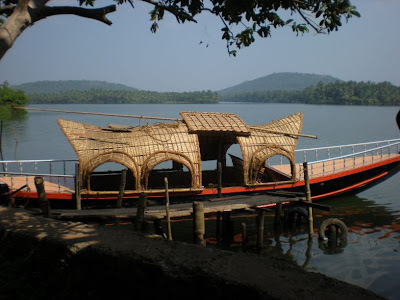 Summer is here, sunshiney days....I have grown to love the sun and heat of india. At least that feels familar here in oklahoma. 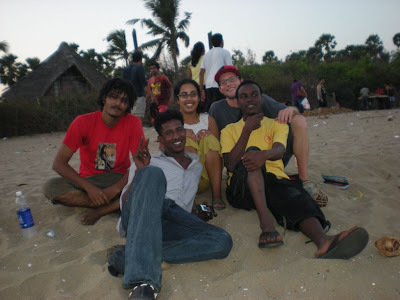 Goa, Kerela, Tamil Nadu and Mumbai times were fun - they got to meet some of my lovely friends, we had 'unforgettable' bus rides, sleepy train rides and lots of beach time. Now back in the big bustling bombay - last couple of months with my friends and trying to figure out what I am going to do next....now I will start the intense job hunt and finish my application for UC Denver PhD program. Lots of the unknown at the moment....I am sure it will all work out, seems to do that in life! 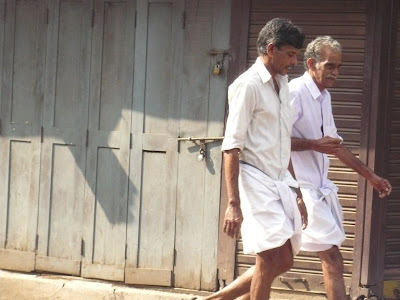 Loongis - man skirts worn often in the south of india. This is the short, hiked up version. 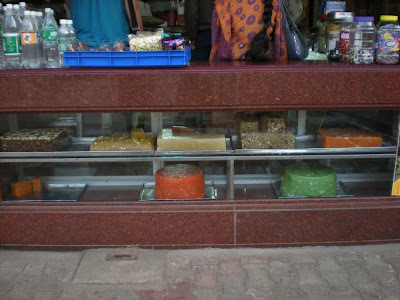 Halwa,a yummy gummy textured sweet. Calicut or Khozikode is a well known area for making this deliciousness. I sampled several and bought coconut and pista. Elephant bling, this guy has gold chains! 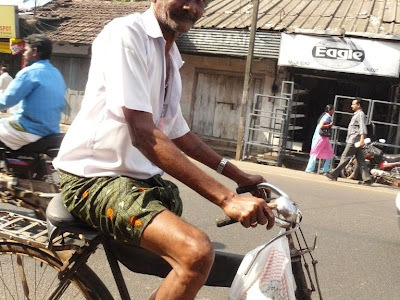 South india, the land of loongis...a man riding a bike in loongi and decorative material too. 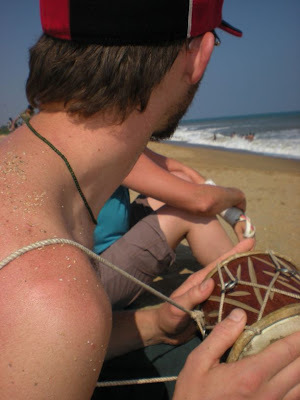 First drum purchased in India, after being harrassed for 4 years by various drumsellers I gave in, Mike's Winter Solstice gift! But our drumseller did follow thru on helping us...surprise. 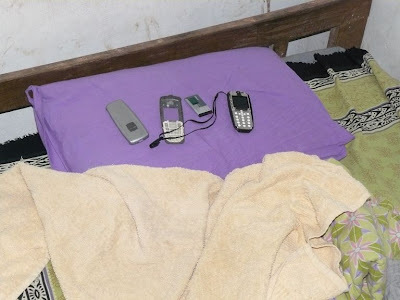 I have been off the net for some time, even before leaving for mumbai, between my screen on laptop dying, moving, hence no net access for a bit, I was not my usual net addicted self. 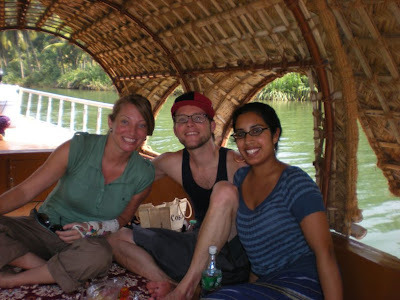 Have had sooo much fun traveling with my brother Mike & his sweet girlfriend Aliya, we split up after pondicherry - they were headed to Chennai then hyderabad to see a friend of aliya's - I stayed back in Pondicherry to see Karilyn and paul off on their rickshaw ride, then since I was going to catch a bus the same direction decided to hop in with them to their first stop. It was fun to travel with them for 1/2 a day. We had planning this trip for 8 months or so,then after my broken arm they found a sub, janikka, but at the last minute she decided not to go - so there was space and paul and karilyn decided, even if I could not contribute by driving (all the starting, clutch and gear shifting is in the left hand/wrist which I broke) that my company was valuable and for the moral support. Makes me feel good to be wanted, but I am also lookng fwd to get my cast off on monday when I am back in mumbai - so perhaps after I get that off and mike and aliya have left, i will meet them in varanasi - towards the end of the adventure, need to check on my finances first and plan my US return. My brother mike certainly knows how to rough it in regards to accomadation, but it is great to travel with him. He is so easy going and resoureful. He found us rooms (all three of us stayed the night for about $5) near the natl park, when we were told nothing was avail. for the night - it will probably be one of the most memorable experiences of the trip, finding the natl park, all the buses, trains and taxis and just trying to find food. In such small villages restaurants close early, or run out of food. We at some rotis (like tortillas) and sambar (the south indian version of the basic lentil soup dal) and they did make us something between an apam and dosa (crispy pancakes made from a batter of fermented rice). Was simple but filling! 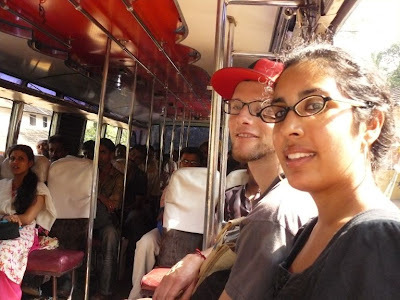 then the overnight bus ride we pushed ourselves and made it into pondicherry, i thought it was 4 hours, ended up being 6! and we had the MOST uncomfortable seats on the bus due it being so full (well, perhaps the man laying on the floor was worse off, but at least he could stretch out the whole way). The 3 of us were bounced a couple of feet of our seats several times throughout the night, with the pot holes and speed bumps the driver took as a challenge rather than suggetion to slow. Aliya and i were dreaming of a hotel my friend janikka sent us a link to and said she had booked for us for our 3 night stay in pondicherry, it look like the most luxurious place we had stayed the entire trip, modern decorations, clean comfy beds - and although the most expensive (750 rupees = $18/night) we were willing, rooms were fully booked around the new year time we were told. Well, as we arrive at 4am our hopes quickly fizzled, Aliya said - "this does not look like the hotel on the internet" not a bit - but turned out to be comfy even with my stained sheets with holes. It did have TV & Air Conditioning! So after riding with paul and karilyn (she just called and told me they had aleady broken done once this morning and were repairing a flat tire at the time she was calling! ha!) about 90 kms (it took about 4 or 5 hours, we broke down once and the machine kept stallling - the new engine could not go beyond 35 kms per hour) I caught a bus, thru much chaos, there were 1000s of other people also getting buses - and i really did not know where in chennai i needed to go, so had to ask 20 diff people, the buses were packed, diffiult to fit on with my big travel backpack - besides not knowing the name of places. 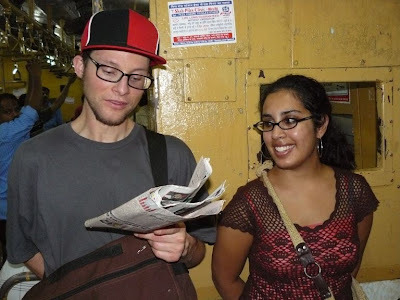 There was an isreali couple wanting to get to the airport in chennai. 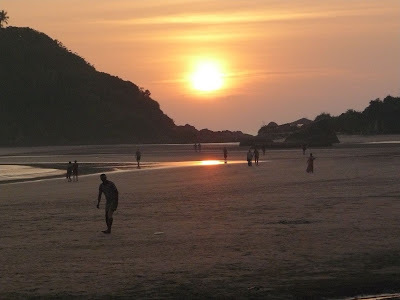 We just about hired a taxi for $30 - huge amt of money due to the shortage of transport, was holiday, new years day so many people had come to the beach and also decided to leave around 9pm, time I was leaving. 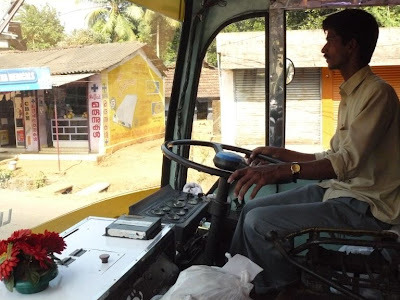 After befriending some guys from Sudan (students here in india) Ended up finding the correct bus for about $1.50, then hired a rickshaw to get to the train stn to get to my 11:30pm train - then had to run around to as the ticket collector if there was any beds avail (overnight train to reach bangalore at 5am) because train was sold out apparently and i had bought a tix for general at 11pm when i finally reached so at the tix collector's mercy. Got on the train with guy from Indian airforce, then finally an hour later talked to the TC and found a bed that was free!! so slept and arrived in the morning to Bangalore. Then i wanted to catch a 6am train but b/c so tired, waited in 15 minute line to get my tix but could not find the correct platform : ( so stood by when i finally found train and watched it pull out, it was going just fast enough i did not feel safe jumping for it, at least wtih a big pack on my back and my arm in a cast. So booked an overnight bus and spending the day in bangalore, good i guess, i can catch up on my emails. i had just hoped to be heading back sooner and getting my traveling over with. I rented a room for the day so i could shower, now will catch up on net, maybe get a pedicure and take a nap or see a movie before my 5:30 pm bus. The adventure never ends, but I love it!! Happy New Year to all - may you have a year full of health, happiness and growth! Odd to see Mumbai shut down for 2 full days. We have had a train bombing since I have been here, frequent political groups calling for 'bundhs' (closing down of shops and city in protest). But usually it is 12 or so hours and Mumbai is back to life. At this posting there still seem to be hostages, the TV channels have cut off news for a bit and possible shootings near the Victoria Terminus. My flatmates are moving flats this weekend, slowly work in mumbai is happening, some shops are open. Feels kind of strange being out and about, not in a fearful way. Feel I am being stared at more than usual, either people are surprised I am out or as a friend said maybe they are curious how I am doing, as a foreigner. 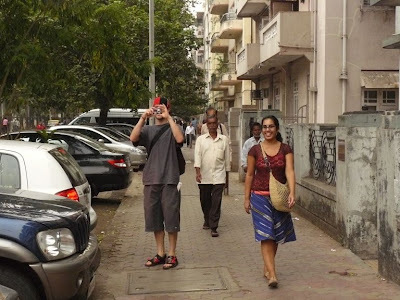 Strange, not usual for foreigners to be targeted in Mumbai. Have come in to the office, mainly to get my laptop fixed so I can actually finish my last week of work. Somber times, our thanksgiving dinner was canceled, it was to be held at the Taj Lands End - thankfully this all did not happen a day later or that 5 star branch may have been a target as there were to be large numbers of foreigners gathered. We did gather a small group of friends in someones home and put together some delicious dishes, all feeling thankful we were safe.